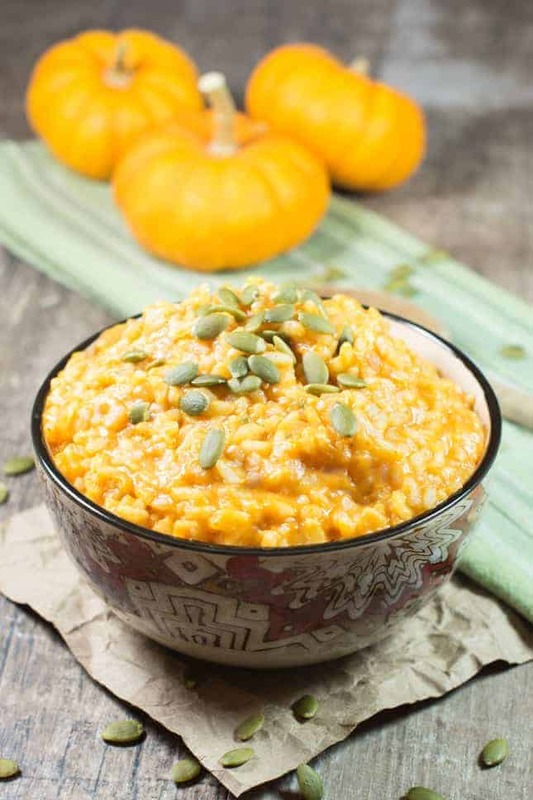 This Pumpkin Risotto is easy to make using canned pumpkin and is perfect as a main course or side dish for any autumn feast! I must confess. I have jumped on the pumpkin bandwagon. Pumpkin can happen to good people. Sometimes it comes in the form of a sweet, piping hot espresso drink from the nearest coffee shop. Sometimes it comes in the form of a creamy scoop of cold ice cream. And sometimes it comes in an unexpected form like hummus. But this time it happened to me in the form of one of my favorite dishes – risotto. Since I got pumpkin happy at the grocery store (I bought a large quantity of canned pumpkin), I pondered the ways I could use pumpkin in everyday dishes. Then it hit me like a ton of bricks (or a can of pumpkin)! Why not make a risotto? Of course! Why not? Or maybe not. We need CHEESE for this dish – Parmesan and Pecorino Romano to be exact. Next, I inspected the spice cabinet. Hmmm. What spices to use?? And the winners are…nutmeg and white pepper! Congratulations! You’ve been selected to appear in this recipe for pumpkin risotto! OK, but seriously…the final part of my mission was to search for the perfect garnish. Eureka! I finally found a use for that bag of organic pumpkin seeds I bought at the store a few weeks ago! To make this Pumpkin Risotto, start by warming chicken broth in a pot. For the vegetarian option, use vegetable broth instead. Then heat butter and olive oil in a wide pan. Next, add minced onion and cook over medium heat until onion is translucent. Add the rice and stir until it is well coated. Then, add the wine and stir constantly until absorbed. Next, add one ladleful of the broth until absorbed, stirring constantly. Continue to add the broth to the rice one ladleful at a time until absorbed, stirring constantly until the rice is tender and has a creamy consistency (will take about 20-25 minutes minutes from this point). Stir in the pumpkin, grated cheese, thyme, nutmeg and white pepper, and cook for 2 more minutes. For the vegetarian option, use vegetarian grated cheese. Salt to taste and top with pepitas! Enjoy! Warm chicken broth (or vegetable broth) in a pot over medium to medium-high heat. Heat butter and olive oil in a wide pan until butter is melted. Add the onion and cook over medium heat until it becomes translucent, about 2 minutes. Add the rice and stir until it is well coated. Add the wine and stir constantly until it is absorbed. Once wine is absorbed, add one ladleful (approximately ¼ cup) of broth. Stir constantly until the broth is absorbed. Continue to add one ladleful of broth at a time to the rice as it is absorbed, stirring constantly, until rice is just tender and has a creamy consistency (will take about 20-25 minutes minutes from this point). Once the rice is creamy and you have used all or most of your broth (you might not need it all), stir in pumpkin, cheese, thyme, nutmeg and white pepper. Cook over medium heat for 2 more minutes. Salt to taste and garnish with pepitas. 1. Omit the Pecorino Romano entirely and use 3/4 cup vegetarian-friendly Parmesan cheese, such as Whole Foods 365 or BelGioioso. 2. Use a combination of a vegetarian-friendly Parmesan cheese (1/4 cup) with a vegetarian-friendly Romano cheese (1/2 cup), such as Dutch Farms. I share the same love of cheese (and pumpkin!) as you and this definitely sounds very comforting and inviting… cheese and pumpkin and all the spices…yummy! Love the personal stories on each of your posts…brings back some memories and also helps to personalize the recipes for your readers. Thanks Neetu! Hahaha! Yes, cheese is sooooo good! 😉 I’m glad you enjoy the stories and you can relate to them! Hey Sherri! Popped over to your blog after reading your sweet comment on mine! I love all things rice, and with the colder months setting in, risottos are going to have frequent appearances in my kitchen! Just made a mushroom risotto last friday, and this pumpkin risotto looks heavenly! thanks for the inspiration! pinning! Looks so comforting and creamy for a chilly, fall day!